Participants will learn the basics of pastured pig production, breeding/breeds, behavioral knowledge & control, shelter needs, feeding and nutrition, and predator control. 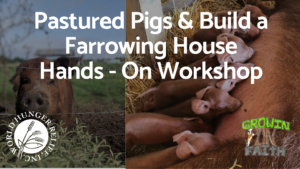 Participants will also gain hands-on experience building a farrowing house. Time 10:00 a.m to 5:00 p.m.
You will receive a confirmation of registration and a request for payment within 2 business days.